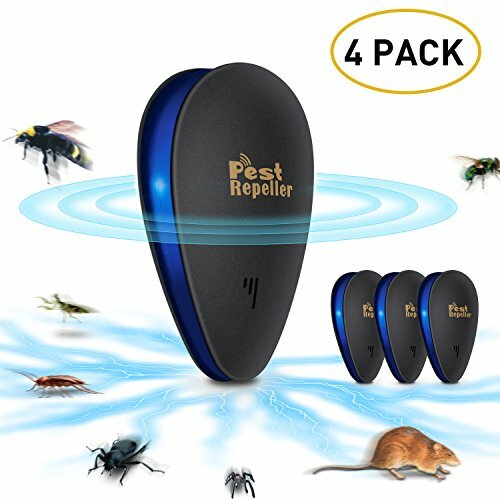 ECO-FRIENDLY PEST CONTROL SOLUTION: They use ultrasonic waves and no harsh chemicals,no nasty traps ,no unsafe fumes,no insecticide, no radiation and use this technology to repel mouse & pests for you. More environmentally friendly than sprays, powders and chemical.No corpses leaving behind to clean up and low power consumption, definitely an eco-friendly pest repeller. Let the dangerous mouse traps, rat poison and mosquito spray out off home. PET FRIENDLY&SAFE&HUMANE: The electronic mouse repellent adopts a physical way to repel mice and pest from your house instead of killing them. This product causes no harm to human or pets（eg:cats puppy or dog etc.）. It acts on pests, such as mice, bugs, spiders, ants, cockroaches, fleas, flies, mosquitos and so forth with no noise, no chemical, and no radiation at all. EASY TO OPERATE:Plug-and-play: They are easy to install! All you have to do is plug them in!Simply plug it in a wall socket 31~47 inches away from the floor and keep it vertical to the ground. It works when the redLED night light on. It has a built in night light too（Low power consumption）, and act as great night lights on the stairs in the hours of darkness. WIDE COVERAGE AREA: The pest control is effective for an area up to 800~1200 sq.ft. Can be used in kitchen, bathroom, office, big apartment, warehouse, workshop, garage, parking lot, etc. Since ultrasonic sound can not penetrate wall and solid object, one room one unit is recommended. As for large storage area with serious pest infestation, additional units is required. 100% SATISFACTIO: 90 Days Product Warranty: Normally, it costs 2~3weeks for a distinct result. No mice can escape our ultrasonic waves. We offer a 90 days warranty from the date of purchase. If there is no content result after 3 weeks, we will issue you a full refund.